When it’s time to install a new furnace, central air conditioner or other type of whole-house heating or cooling unit, we invite you to schedule a free at-home consultation with a Sears heating and cooling expert. Our expert will explain your options, so you can choose the HVAC unit that’s right for your house and budget. We promise Worry-Free Performance of our products with Manufacturer-Backed Installation Warranties and Sears Satisfaction Guarantee. *System must be purchased between 3/18/19 – 6/30/19, and installed & claimed by 6pm, CST on 7/31/19. Up to $1650 Carrier Cool Cash rebate applies to the purchase of complete Infinity Series System (Greenspeed Heat Pump condensing unit, Infinity Furnace or fan coil, Infinity Control (SYSTXCC), Ventilator ERV / HRV, Humidifier (STM) and UV Light (UVL) with an Infinity Air Purifier (GAPAA, GAPAB)). Rebate range $25 - $1650. Homeowners may claim their rebates and/or check the status of their rebates online at www.carrierincentives.com. 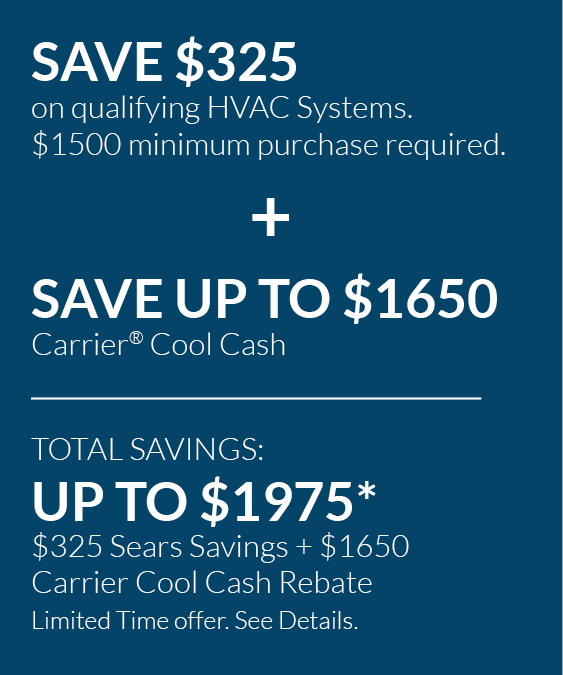 SEARS offer: Save $325 on HVAC purchase of $1500 or more. SEARS Offer expires 7/31/19. Not valid on prior sales or in combination with any other Sears offer. Purchase requirement before taxes and after other discounts and must be made in a single transaction.